Our shower curtains are designed and produced by well-known German brand Kleine Wolke, established in 1968, and is backed by their quality guarantee. No liner necessary. Quick-dry and easy-care polyester fabric, durable and long wearing. Royal Blue: Artful shower curtain with royal blue, deep purple, soft light grey and bright spring green paint spots on solid white background. 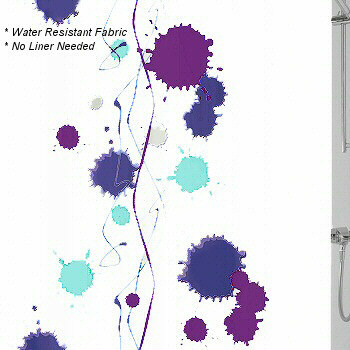 This non toxic fabric shower curtain is available in standard tub width with 12 eyelets.